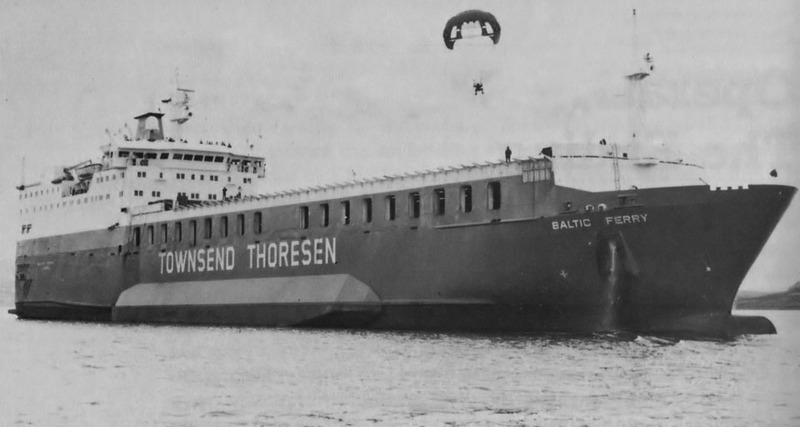 May 7th 1978: Launched as STENA TRADER. 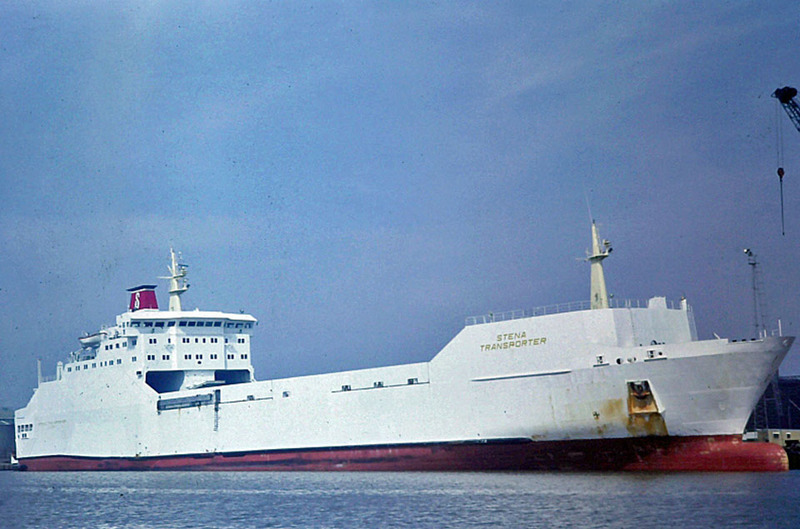 September 15th 1978: Delivered to Stena Cargo Line Ltd, London, England as STENA TRANSPORTER. 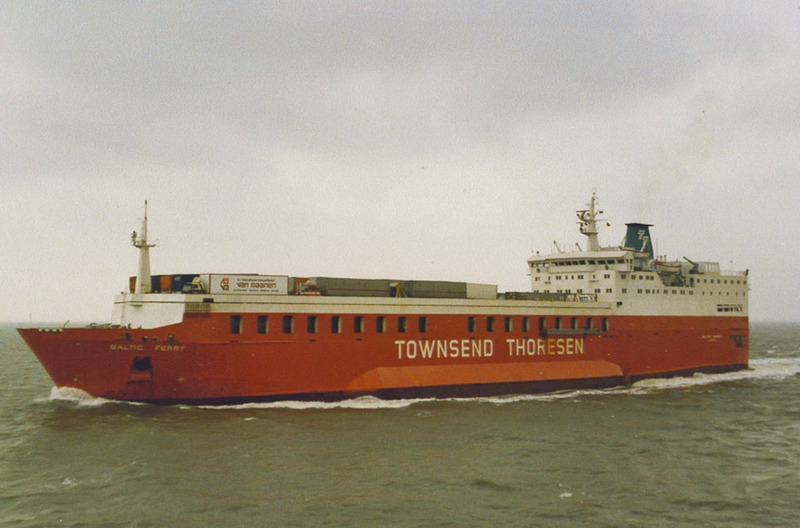 September 1979: Chartered to Atlantic Cargo and renamed FINNROSE. 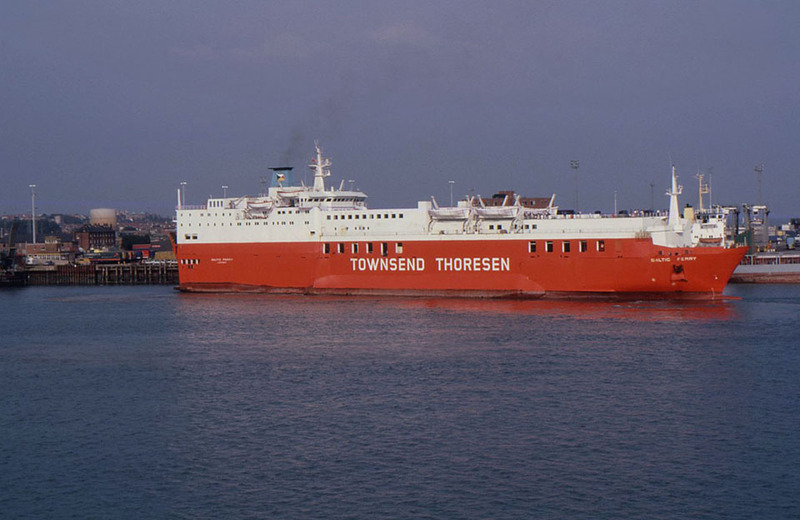 July 25th 1980: Renamed STENA TRANSPORTER. 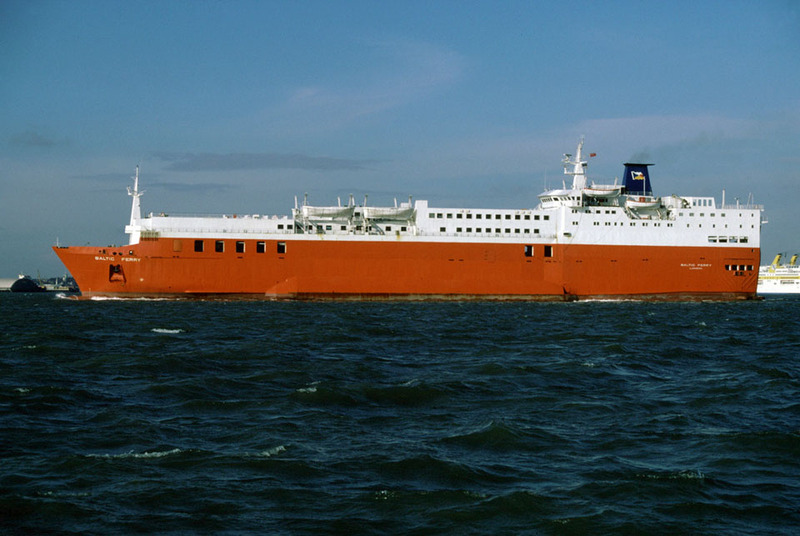 October 6th 1980 – December 13th 1980: Rebuilt at Hapag Lloyd Werft GmbH, Bremerhaven, with extra passenger accommodation and weather deck. Side-sponsons added. 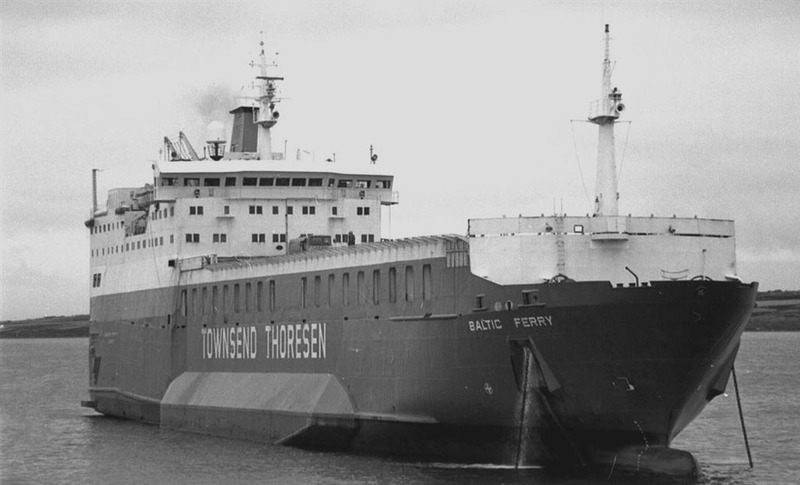 December 1980: Chartered to Townsend Thoresen European Ferries, Dover, England and renamed BALTIC FERRY. 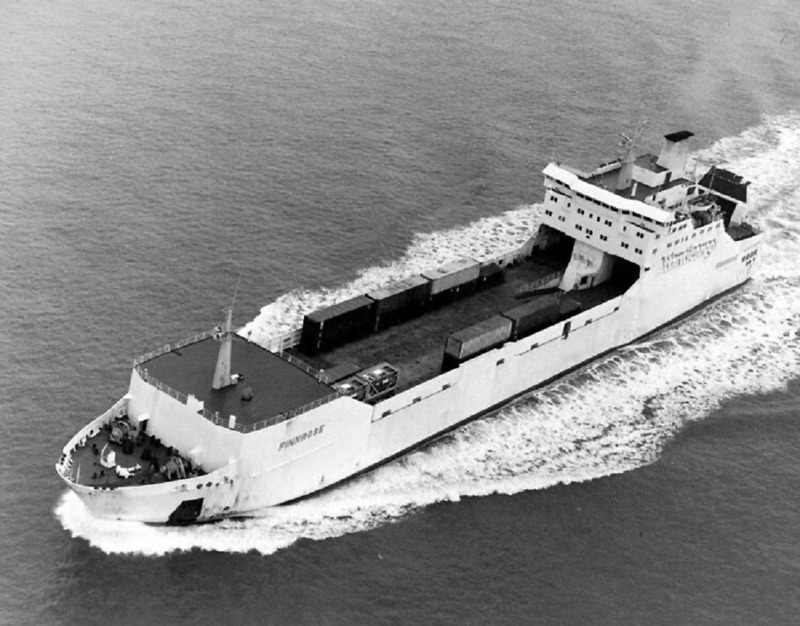 May 2nd 1982: Requisitioned by British Armed Forces (Royal Marine) to transport supplies to the Falklands and ordered to sail immediately to Portsmouth for modifications prior to the voyage south. 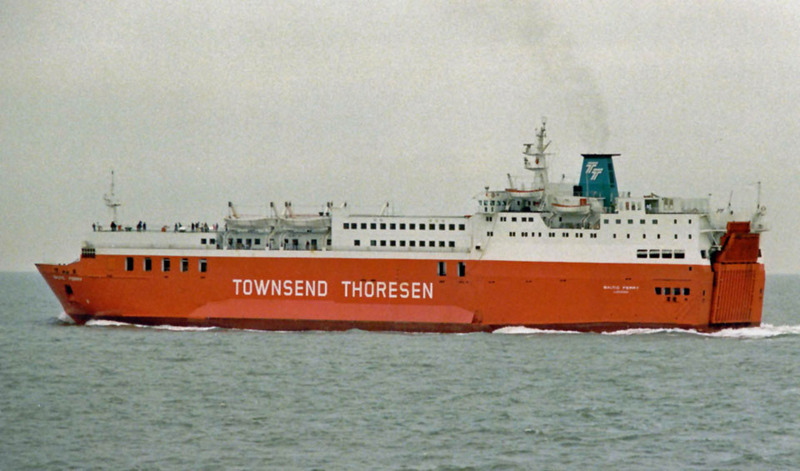 May 9th 1982: Sailed in company with NORDIC FERRY to Falklands. 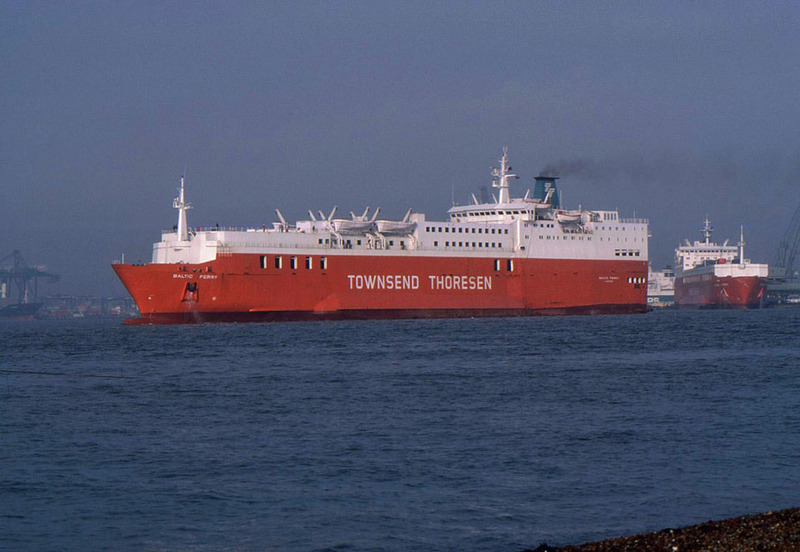 May 20th 1982: Arrived at Ascension Island for bunkering. May 30th 1982: Arrived at Falkland Islands. June 1st 1982: Anchored in Ajax Bay to disembark troops and stores. Made three more visits to San Carlos Water and then went to Port Stanley where she remained as a stores ship. April 1983: Returned to England. 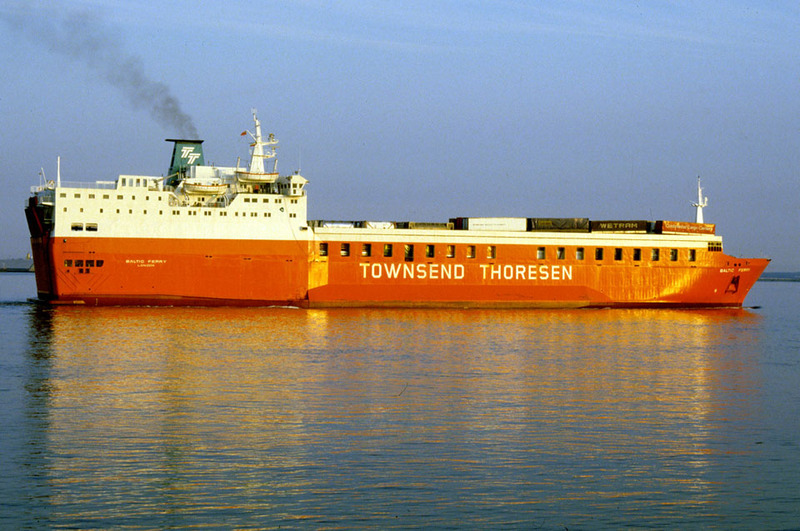 April 12th 1983: Re-commenced services between Felixstowe – Europoort. 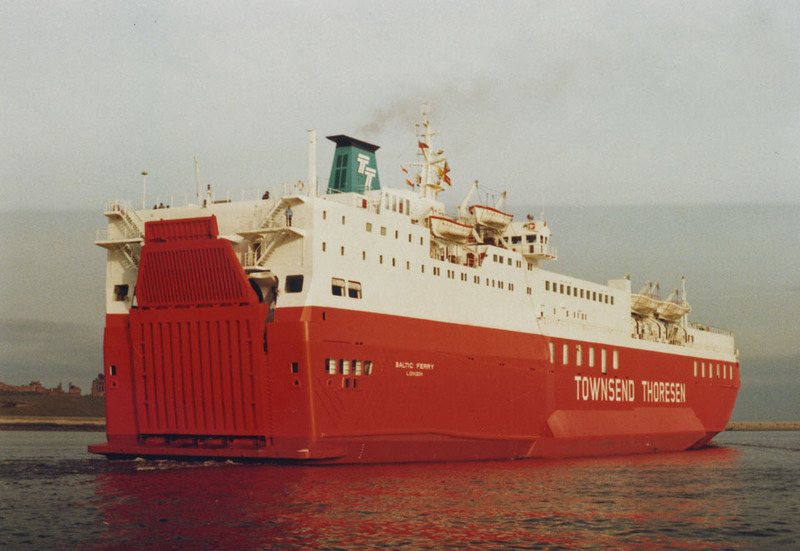 February 1986: Converted to a passenger ferry at Wilton Fijenoord B.V. Rotterdam, Holland. 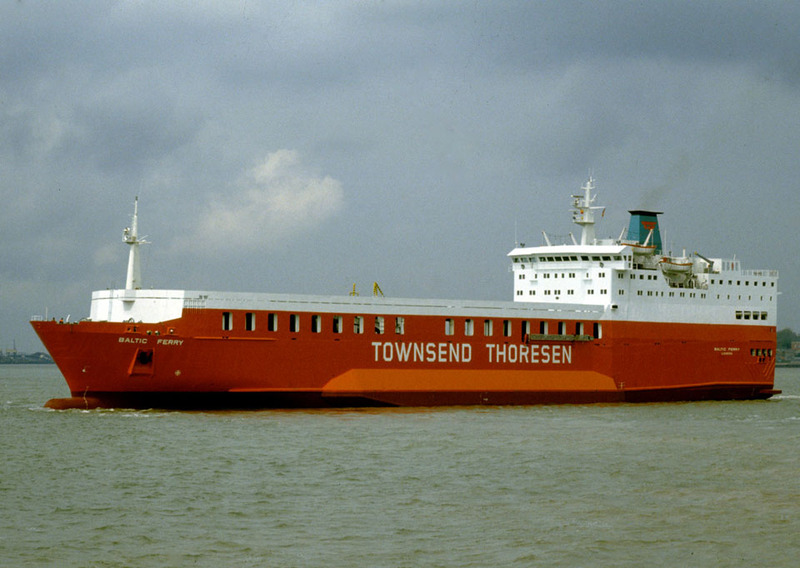 May 23rd 1986: Re-delivered from yard and commenced services between Felixstowe – Zeebrugge. 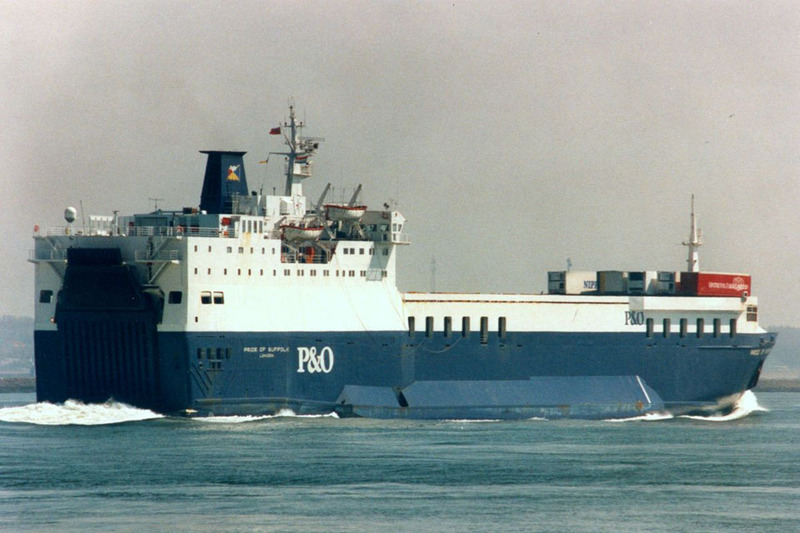 December 31st 1987: Registered to P&O European Ferries, Ltd, London, England. March 18th 1991: Sold to BMBF(No. 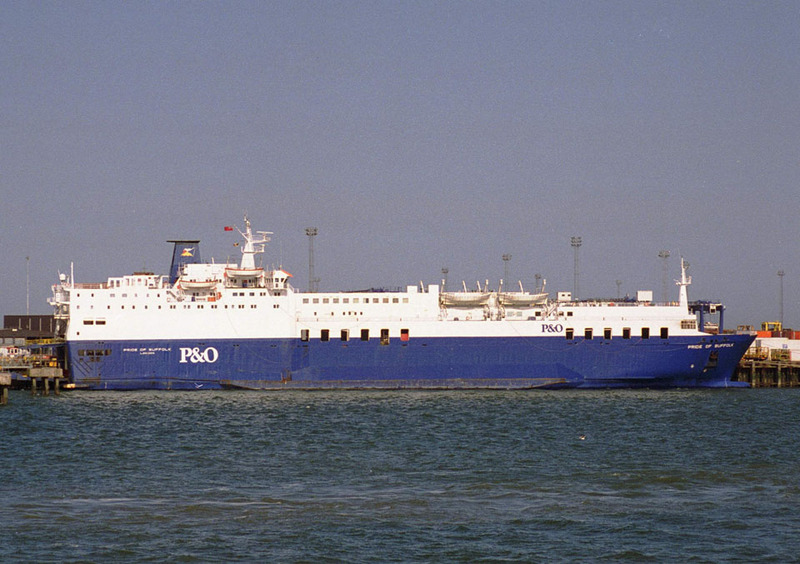 15), London, England and bareboat chartered to P&O European Ferries, Felixstowe. 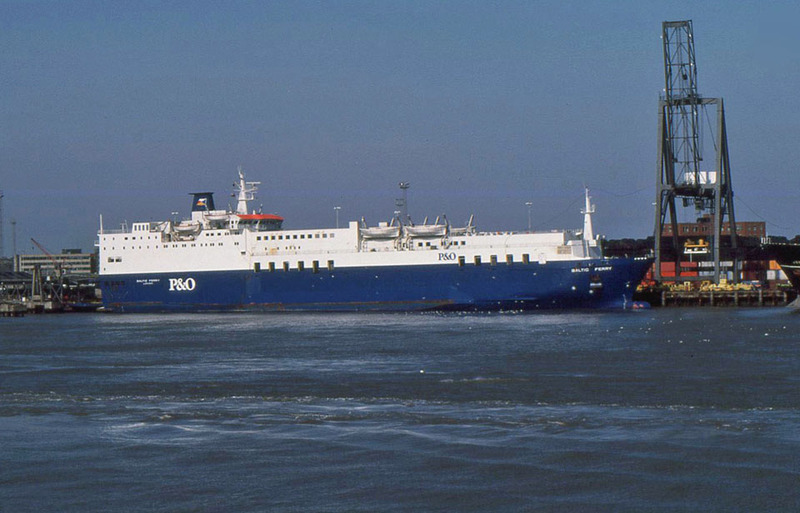 February 1992: Renamed PRIDE OF SUFFOLK. 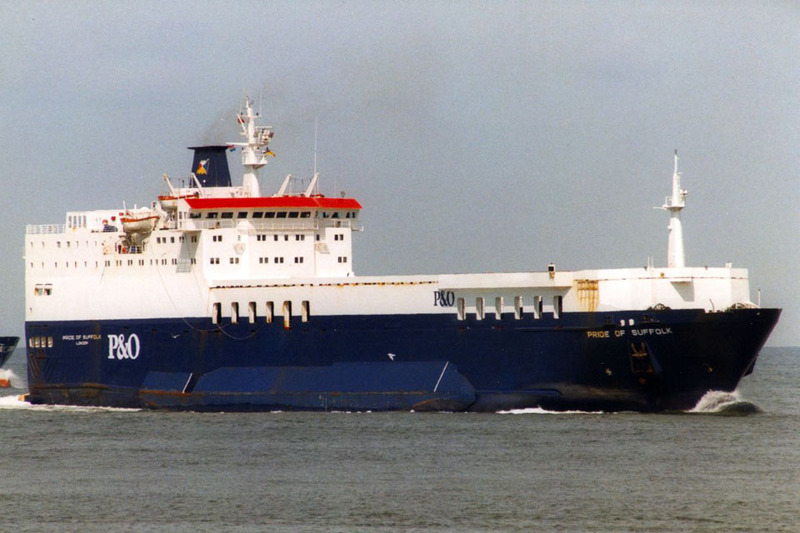 October 22nd 1995: Expected return to Felixstowe – Zeebrugge as a freight (only) ferry. October 25th 1995: Arrived at Harland & Wolff, Belfast for rebuilding as a freight ferry. 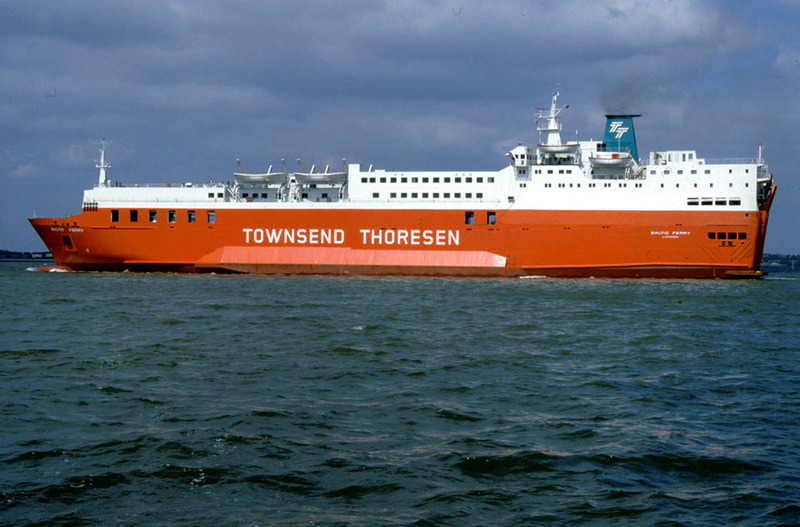 November 1995: Commenced service between Felixstowe – Europoort. 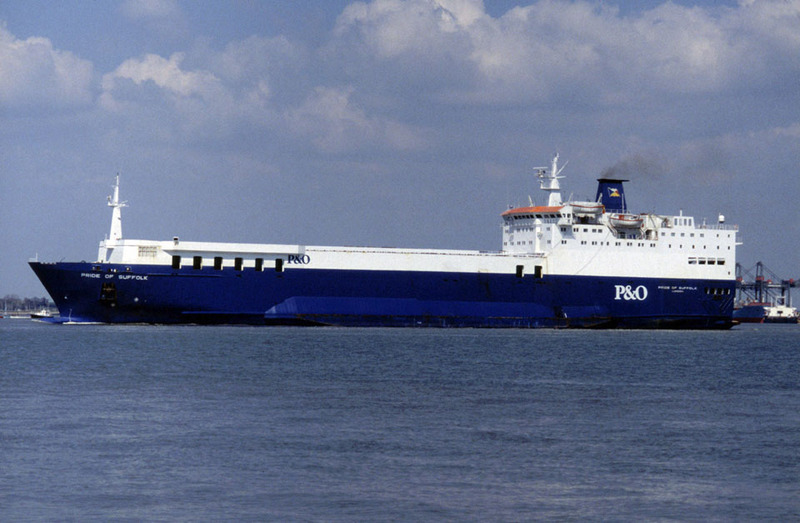 October 2001: Commenced service for P&O Irish Ferries between Liverpool – Dublin. November 2001: Renamed EUROPEAN DIPLOMAT. 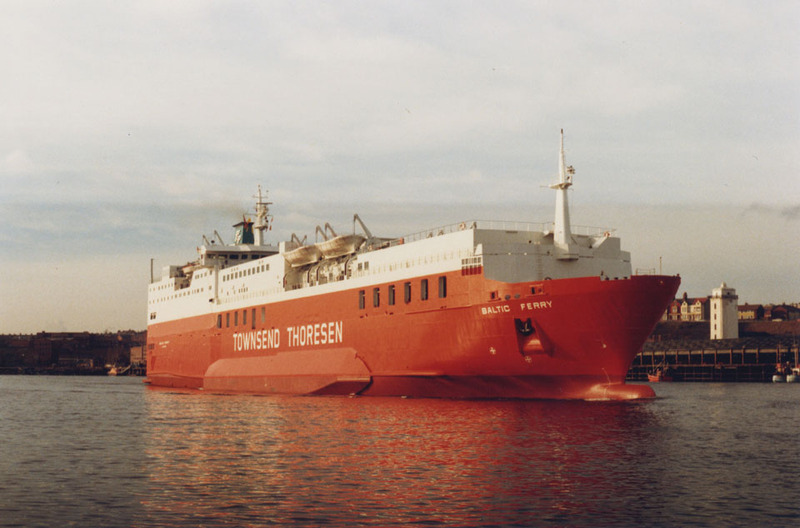 January 18th 2002: Services between Rosslare – Cherbourg. December 2004: Laid up at A&P, Birkenhead. 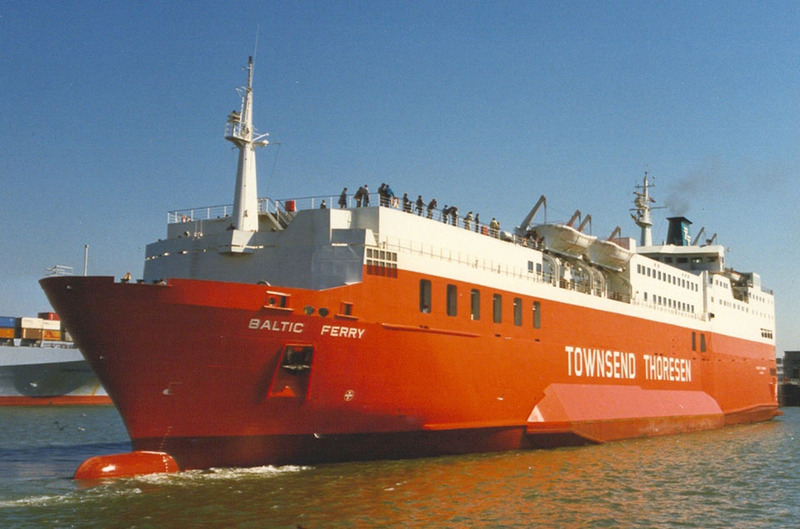 January 2005: Sold to Celtic Link Ferries, Ltd, Rosslare, Ireland. January 24th 2005 – January 27th 2005: Services between Liverpool – Dublin. 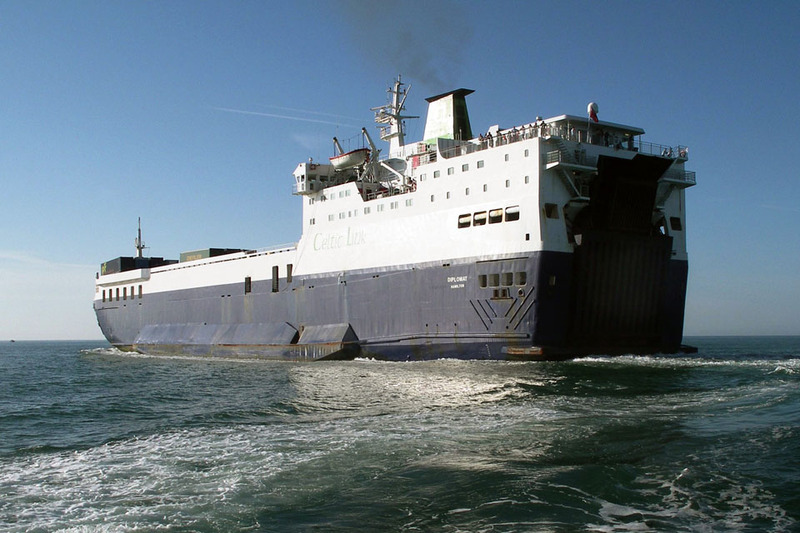 January 27th 2005: Arrived at Rosslare and taken over by her new owners. January 28th 2005: Renamed DIPLOMAT. 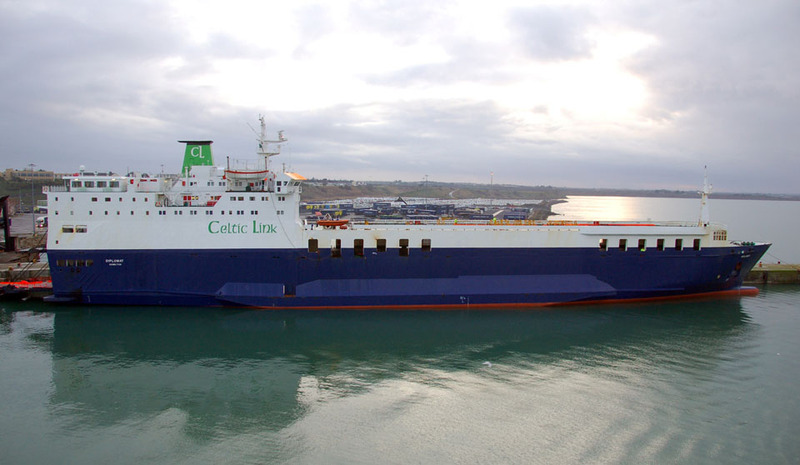 February 1st 2005: Services between Rosslare – Cherbourg. 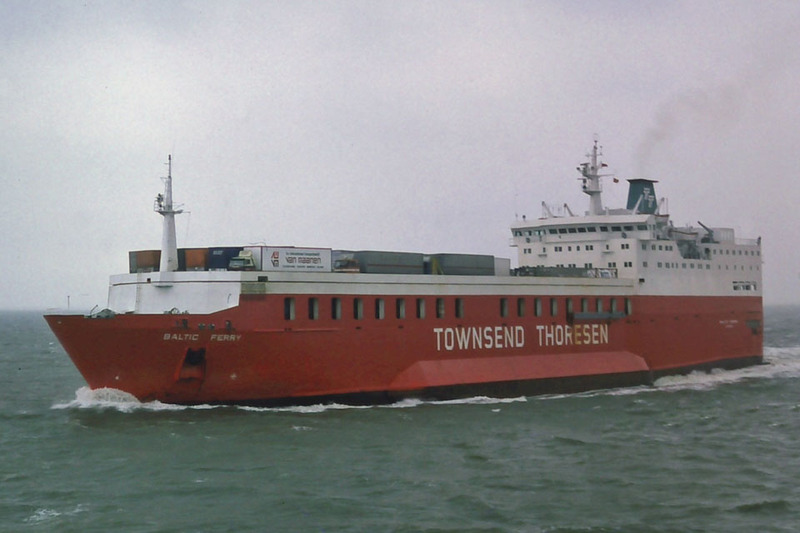 February 13th 2005: On a service between Rosslare – Cherbourg suffered engine problems and, after 4 hours, sailed to Falmouth. December 19th 2005 – January 14th 2006: Refit. September 28th 2009: Berthing trials in Portsmouth. 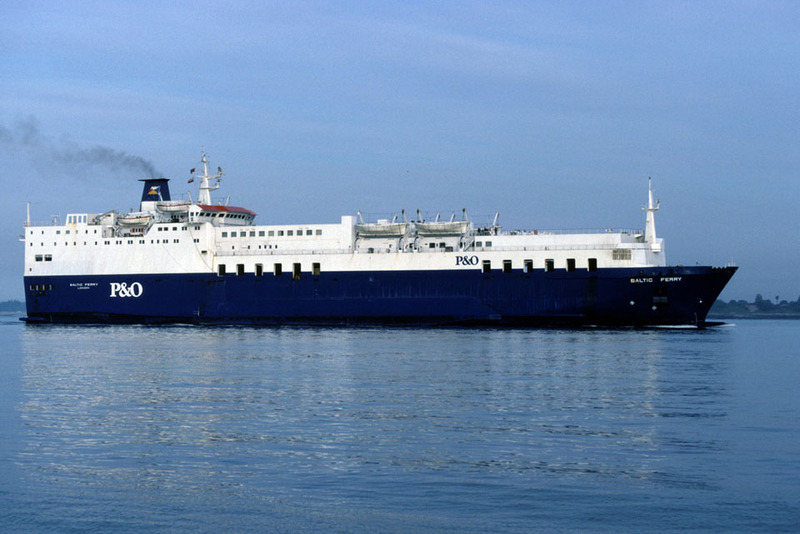 October 2009 – November 20th 2009: Services between Cherbourg – Portsmouth. December 23rd 2009: Last call at Rosslare. 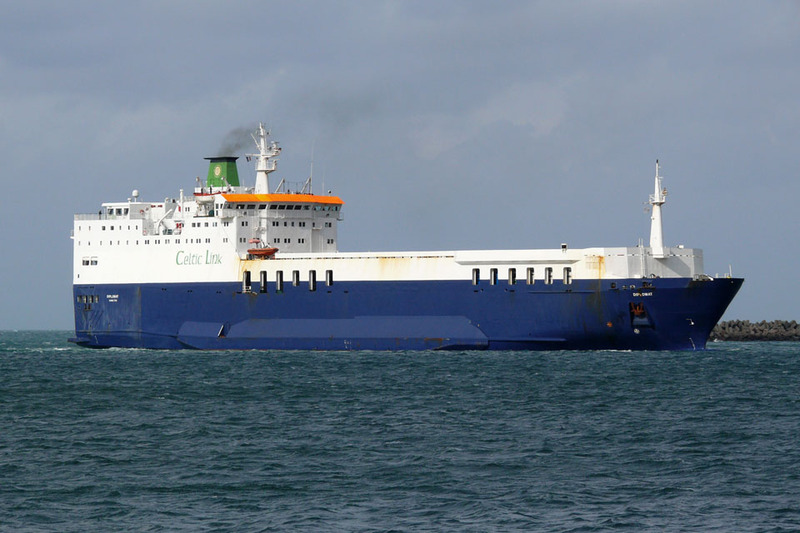 December 29th 2009: Left Rosslare for Dublin and lay-up. 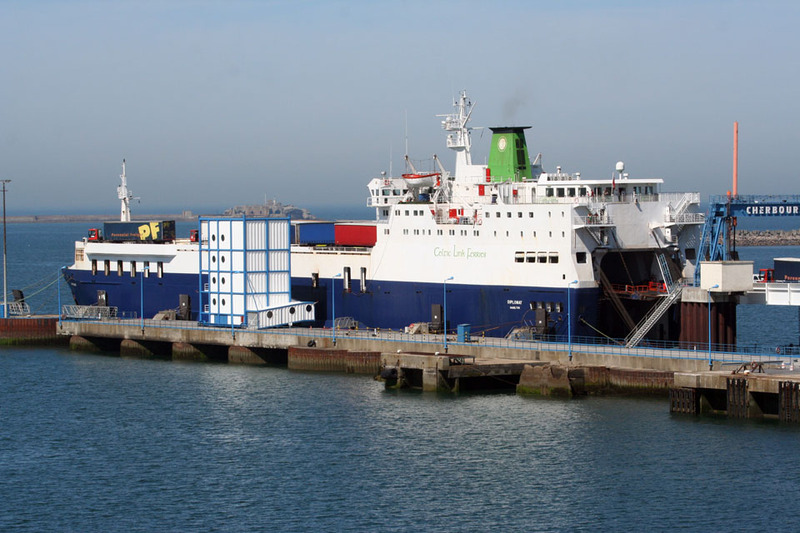 January 13th 2010: Left Dublin for Rosslare. 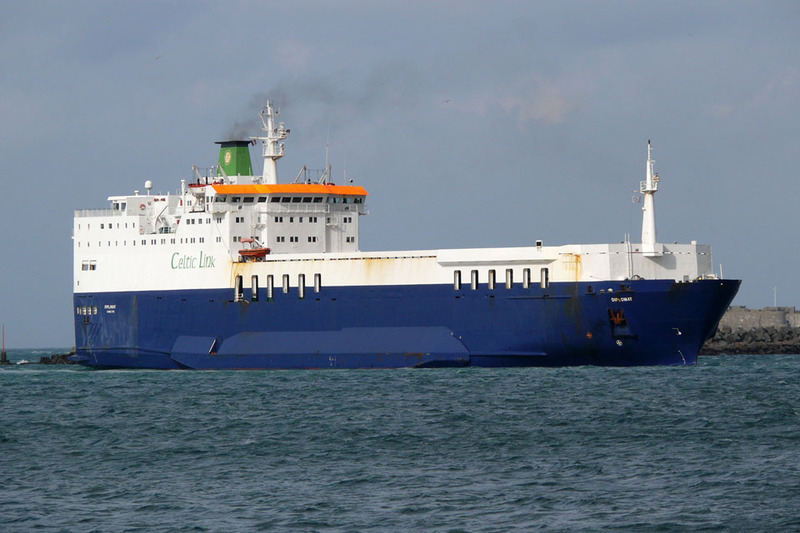 February 25th 2010: Left Rosslare for Waterford and lay-up. April 2010: Chartered to Marine Express. 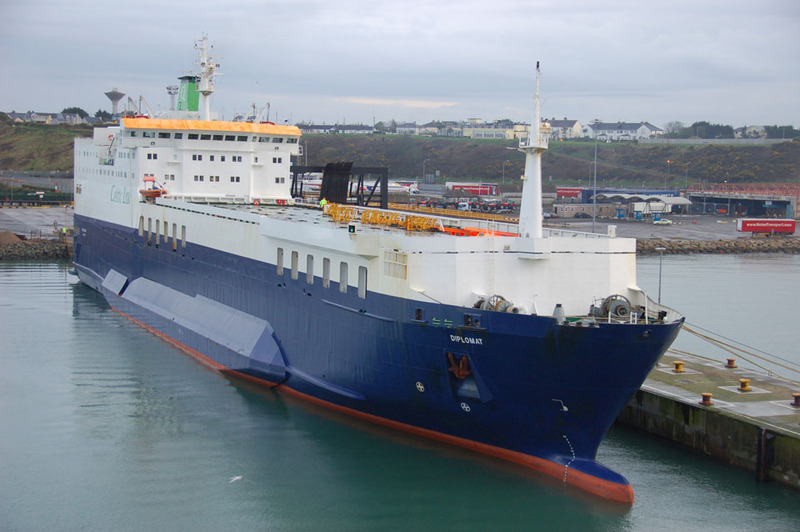 April 2nd 2010: Left Waterford for Puerto Rico via Rosslare. April 2010 – March 18th 2011: Services between Santa Domingo – Mayaguez. April 2011: Sold to Argo Systems Fze, Dubai, United Arab Emirates and renamed PAVILION. May 2011: Left Santa Domingo for Salvador, Brazil. May 28th 2011 – June 15th 2011: Left Salvador for Cape Town. June 19th 2011: Left Cape Town for India. August 7th 2011: Arrived at Alang, India for scrapping. All information is believed to be correct and no responsibility is accepted for any errors or omissions. All items included in this article are subject to © copyright. We would like to take this opportunity of thanking: Tim Becker, Cees De Bijl, Charlie Chambers, Brian Fisher, Tony Garner, Ton Grootenboer, Ken Larwood, Ken Lubi, Bob Scott, Joerg Seyler, Simonwp, Ulrich Streich and Andreas Wörteler for their assistance in producing this feature. Very interesting this report on this kind of ship. I wonder if it will be possible to obtain a copy , it will be find, it only for my historic about differents ship. Not for the web. It doesn’t matter what will be your answer, go on to show us marvellous pictures.